The Canadian, Montreal based duo Headscan fuses futuristic dancefloor oriented music with dark cinematographic soundscapes. The band combines the best elements of trance and electro industrial resulting in a sound that is fresh and exciting, while holding true to its predecessors in electronic music. Claude Charnier (electronic flow control) & Christian Pomerleau (human frequencies) have been active in Montreal's local alternative music scene for some years now, particularly within the techno industrial outfit Insurgent, playing a hard and intense mix of electronic and acoustic music. Claude Charnier (electronic flow control) & Christian Pomerleau (human frequencies) have been active in Montreal's local alternative music scene for some years now, particularly within the techno industrial outfit Insurgent, playing a hard and intense mix of electronic and acoustic music. 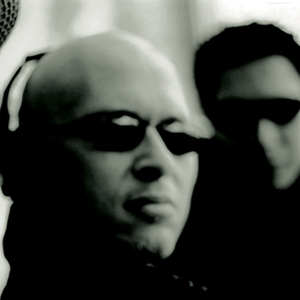 Co-founder of that band, Claude did the music for two cds, "System Structure Security" and "Supercollider", before leaving the group in 1999 to focus on a mainly electronic music project. Christian came to be the singer of Insurgent later in that bands history before creating Headscan with Claude , bringing also his talents in motion graphics and web design. Signed to Artoffact Records in 2001 they've released their first album entitled Shaper and Mechanist to great reviews worldwide. Dark moods, electronic voices, bubbling basses and relentless beats create a futuristic soundscape for the new dark ages inspired in parts by the writings of science-fiction author Bruce Sterling. Observing the impact of new technologies on society and its influence on the transmission of ideas, the band evokes the public domain as being a vast field of human memory. As the continuous onslaught of modern technology breaks down the barriers of culture and geography, the public domain becomes embedded in our collective mind; where the spirit meets the mechanical. In September 2005, HEADSCAN have joined the Alfa Matrix label for Europe for the release of their much anticipated new album "Pattern Recognition". A mind-blowing sonic assault that offers you a window to what the future of electronic music will ultimately be and firmly places HEADSCAN amongst the elite of electro industrial made in Canada. HEADSCAN writes music about the future, but we know that the future will also write about HEADSCAN. Keep them on your radar!